What would Rav Soloveitchik zt”l say about the separation of children and parents by ICE agents? The question is inherently silly, like all questions of the form “What would X say,” where X is someone important who has not graced this planet for some time. The question is not asked about people who are simple and predictable. We ask it only about complex, interesting people whose responses might surprise as well as illuminate. Their very complexity makes it impossible to know what they would say about a situation that they did not face in their lifetimes. What is worthwhile considering is that we wouldn’t even ask the silly question about virtually anyone in a leadership position of the Torah world, because they all refrain from commenting on issues that don’t immediately impact Torah Jews. That realization leads to two questions. 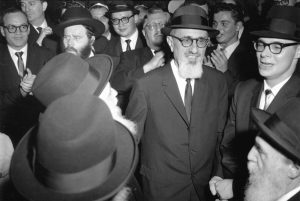 Why did Rav Soloveitchik choose to be different? And how did he bring his Torah personality to bear upon issues in the world outside the daled amos of halacha that he loved so dearly? We have no choice but to leave the first question to the various interpreters, family members, etc., who have disagreed for decades about who R. Soloveitchik was. About the second question, our problem is where to begin to wade through the voluminous material that he left behind. The serious students of R. Soloveitchik know where to begin. It is the rest of us who are bewildered. Some five years ago, a new door into the world of R. Soloveitchik opened up. With the recent publication of Devarim, the Mesoras HaRav Chumash is now complete. What will the reader find here? Here are a few unrelated thoughts from the new volume, a kind of sampler, if you will. Rav Soloveitchik here neither accepts nor disputes the validity of the proofs. He simply rejects them as unnecessary and even irrelevant to core belief, which grows out of the individual connection to HKBH. Had Jews reproduced naturally over the generations like other nations, there would today have been at least 150 million Jews. As a result of repeated persecutions and assimilation, we are instead a tiny people…But that is not coincidental, for it reflects the abiding truth of the Torah’s statement, “For you are the fewest of all peoples.”…The greatness of its faith and people lies precisely in its remaining small in number…As a result of our small numbers we have avoided the fate of other peoples and faiths…Only a select group can be expected to maintain the strictures and responsibilities demanded by our faith. Had either Rome or Arabia converted en masse to Judaism, the result would inevitably have been the thorough dilution, distortion, and ultimately the disappearance of Judaism as a religion. This passage should give us pause things happening in our community, as it grows by leaps and bounds, BH, while others shrink. Too often we are seeing that there is a cost associated with rapid growth – one of “dilution and distortion” of the real Torah mission. In sharing this, Dr. Lustiger captures an important element of his accomplishment. Many people in the larger Torah world could not care less about interrelating “halachah, psychology, and Platonic ontology.” There is nothing wrong with that. They are increasingly discovering the most important role of R. Soloveitchk, as a massive talmid chacham, whose chiddushei Torah have, in the decades following his death, spread throughout the Torah world. Yet there are others who very much are looking for ways to make the different spheres of knowledge less disjoint. Not to diminish the distinction, the havdalah, between kodesh and chol, but to show how the kodesh can illuminate the chol, without a dualistic assertion of opposing universes. Those who indeed wish to show how “halachah, psychology, and Platonic ontology” can work together without sacrificing the primacy of the first will find a good introduction in the Mesoras HaRav Chumash. Devarim is now in the bookstores. R Adkerstein is correct. Dr Lustiger demonstrates once again that one need not have learned in RYBS shiur or have intimate firat hand knowledge of the differences between what RYBS said in his shiur or other venues such as Boston to faithfully and properly set gorth RYBSs views in proper nuance . What is “Rav Elchonon Wasserman zt”l’s argument”? Briefly, Rav Elchonon zt”l wrote that the existence of G-d is self-evident simply through the very existence and apparent design of our world. Everyone should and would see it, if it were not for the subjective need to feel free to do what one wants, without some Authority with a big stick standing over him and making demands. The golden age of kiruv is ahead of us, and for all of us, regardless of our current level. I am reminded of perhaps the most famous phrase in the entire Torah, where we are commanded to love our neighbors as ourselves. There are actually two parts to this process. The more famous part, of course, is to have empathy for other human beings, but what is often overlooked, is that before we can reach out to others, we first need to love ourselves. And the same thing when it comes to being Jewish, and our relationship with the non-Jewish world. We Jews are expected to be a light unto the nations, and yet we cannot be that Spiritual Light, if we do not first develop ourselves as Jews. Before we care about saving the world, we need to first care about ourselves and our fellow Jews. And yet as Hillel points out, “If I am not for myself, than who will be for me? But if i am only for myself, then who am I?” As important as it is for us Jews to stick with each other and help each other, ultimately we do have a vast non-Jewish world to contend with. Even our forefathers, in establishing our spiritual path whose footsteps we have been trying to emulate ever since, had to constantly contend with the outside world, whether it be from inside their own families (for example, Ishmael, Lot, Eisav and Lavan) to being ruled by non-Jews in the case of Ancient Egypt. If we keep only to ourselves, then as relevant as we may perceive to be to one another, we essentially go the way of the Amish, becoming irrelevant to the rest of the world. This clearly cannot be what G-d intended for us, not when the land of Israel is situated right between the three major continents of the Old World, that of Europe, Asia, and Africa. It is as if we are located at Grand Central Station, from which we send out not trains, but our spiritual messages to the whole world. And so it seems to me that rather than keep only to ourselves while dismissing the rest of the world, that a far more constructive approach is to make sure that we are first developed solidly as Jews, and then go and reach out to the whole world, while seeing things through our Jewish eyes. Just to give one example of what is meant here, instead of ignoring America’s Founding, we can notice how its Declaration of Independence talks about how all of us are created equal, and we can then contemplate how close that is in meaning to G-d telling us near the very beginning of His Torah how each of us are created in His Image, and how that phrase anticipates by many centuries the creation of democracies, where nobody is inherently above anybody else, and where individual freedom reigns supreme. I have also recently heard about how Winston Churchill studied our Torah with some measure of depth, and how that informed him when facing the nazis. It may therefore be no coincidence that just as Avraham stood alone against the world’s first fascist dictator whose name was Nimrod, so did Churchill stand alone at one time in opposition to the nazi attempt to take over the world. In the end, Churchill defeated that evil, and hopefully the time will come when we Jews will defeat the evil of antisemitism, wherever it may be. There is a fundamental essay by R. Chaim Pinchas Sheinberg titled “Shoresh HaEmunah–B’teva HaNefesh HaYisraelis” in his sefer Derech Emunah U’bitachon(pg. 63, parshas Beshalach). R. Sheinberg differs with aspects of the Kovetz Maamorim referenced here based on Rishonim. I transliterated one of the relevant parts in “Rabbi Yosef Grunblatt, z”l”, a November, 2013 Cross Currents post, where R. Adlerstein quoted R. Grunblatt as similarly questioning R. Elchanon’s position. R. Adlerstein wrote then that R. Grunblatt had ” the yiras ha-rommemus for R. Elchonon (unlike many others I have encountered)”. Indeed the language used by R. Sheinberg (“eino mestaber lechorah”) is no different than were he to question an explanation of R. Elchanon in Kovetz Shiurim of a halachic sugya. Agreed,unfortunately his SIL are in the olam haemet-his children are all in their 80s . For a relatively recent article by a child see Reflections on the Influence of the Rov on the American Religious Jewish Community by Dr Tovah Lichtenstein in Tradition Vol 44 No 4 Tradition Winter 2011 from which I have copied the following. For a number of years, I worked in Northern Indiana in an area where many Amish people live. They seem to have developed work-arounds to use some modern devices such as lathes in their workshops. Once, shopping at a Radio Shack in Goshen, IN, I came upon an Amish man discussing routers with the sales clerk. Their horse-drawn buggies now have lights to use at night. The big Walmart in Goshen has hitching posts in the parking lot and a large heated shed to park the horses/buggies in the winter season. Wrt comments above. Dr lustiger, a neighbor, has done a great job assembling the Rav ztl’s divrei Torah organized as commentary on the Torah. That is very different from commentary from those very few who can broadly and only tentatively express his POV. His commentary on the parisha was often drush not always reflecting his overall predominant view. There is a Yiddish saying that “he who knows, does not speak. He who speaks, does not know”(also attibuted to Lao Tzu). Ironically, the certainity in calling a lack of proof “heresy” is, today, often accompanied by a lack of knowledge and the unwillingness to engage in open debate with knowledgable people, which is what “proof” requires! Rav Soleveitchik spoke about proofs in various places similarly to the quote here, for example, ” As mentioned in the text, we do not need these demonstrations as proofs, because the experience of God is the basis of certainty”(“And From There You Shall Seek”) and of “teviyas ayin” being better than “simanim”(“Abraham’s Journey”), as well as in The Lonley Man of Faith. A powerful source of particular relevance to the yeshivah world is an essay by R. Chaim Pinchas Sheinberg titled “Shoresh HaEmunah–B’teva HaNefesh HaYisraelis” in his sefer Derech Emunah U’bitachon(pg. 63, parshas Beshalach). R. Sheinberg differs with aspects of the Kovetz Maamorim referenced here based on Rishonim, and is similar to R. Soleveitchik in going beyond proofs. I transliterated one of the relevant parts in “Rabbi Yosef Grunblatt, z”l”, a November, 2013 Cross Currents post, where R. Adlerstein quoted R. Grunblatt as similarly questioning R. Elchanon’s position. Dr Bill was part of your comment accidentally omitted? Dr Bill you will find manybcomments in the Noraos HaRav series from which the Mesoras HaRav Chumash commentary is in no small measure based whwre RYBS expresses his POV in a way that no reasonable reader would regard the same as mere drush.EYBS regarded Ramban on Chumash as serru g forth a far more authentic commentary s view far more rooted in Chazal than the MN. Mycroft it would be correct to note that we have debated and discussed your link which you provide in this discussion which in this context IMO is of marginal relevance and ignores the fact that a talmid does not cease being a talmid merely because he suvscribes to a view different than a rebbe on one or more positions a fact thst can be found throughout Shas. In on e of the Noraos HaRav volumes on Musaf of RH RYBS stated that Malchiyos Zicronos and Shifaros were the most eloquent statement if the elements of Hashkafa he had ever seen. To determine anyone’s position on anything see what they did in their lifetime in practice. Certainly, documented behavior of what they did or the institutions which they controlled did . Chakiras that they might have said in shiur may or may not reflect their opinions. No one ever disputed the Rav was a big talmid chacham, however he was never accepted as an authority by the “Yeshiva World”while alive. There are reasons why he was not accepted. the hashkafic differences between him and the Yeshiva world were great. Itis easy to after death reinterpret a gadol.He is far from the first, most obviously even greater it was done to RSRH. Reinterpreting a gadol while accepting his obvious non controversial Torah is what is being done. Many, many more examples, including the Maharal and Ramchal. Perhaps what we see is that history, as one of the tools of Divine Hashgacha, has a habit of dismissing the less important and maintaining what is most valuable. That usually turns out to be the Torah content that can be embraced by the greatest number of people. in his influence in the United States. which invested its major efforts in Erets Yisrael, has suffered setbacks. which the Israeli fi nds himself, personally, culturally, and internationally. Thus,if you maintain that who is followed is based on Hashgacha one must state that Hashgacha wanted the influence of the Rav to increase in Israel, but decrease in the US. In general I do not believe that you want to consistently follow the idea that numbers of followers of any hashkafa,belief system is a proof that God favors that hashkafa . Mycroft did you ever see RYBS daven on the Yamim Noraim and his well documented post YK mood? The analogy to Rambam that R Willig made during a hesped is obvious.RYBS gsve shoirim.drashos and wrote articles that were intended for different audiences. Denial of that fact is revisionism writ large. It should be noted that while RYBS noted that were Shomrei Shabbos in the US there qere precious few who appreciated Erev Shabbos and the positive values of Chasidus and pashute Yidden that he saw in his youthful years. We need not await the prattling of academics to tell us of the Gadlus of RYBS in his full package. It is wrong to simplify RYBS by resorting to non Brisker terms such as chakiros when RYBS stated his POV on a wide range of issues in a wide range of venues including RIETS the RCA and Boston. Dr Bill obviously RYBS used halacha as the basis for drush. That should not be confused with with reading hashkafic predectuons into halacha.RHS spoke about tbis at the recent OU event at Citifield. Someone’s range of influence right now might not be predictive at all. Known minority approaches have often sprung back to life as times and conditions changed. Likewise, neglected strands in someone’s thought system have attracted new interest down the road. Dr. Lee Spetner has proposed a biological theory based on built-in adaptability of species (see https://www.judaicapress.com/products/the-evolution-revolution ) which could have its counterpart in the world of Torah thought and application. No-I davened elsewhere in Yamim Noraim-What you want me to say I believe is undisputed and consistent with what I observed other moadim and Shabbos that the Rav had great happiness from doing mitzvot,I observed that. and his well documented post YK mood? Have to be careful about Post YK mood-one of the years I was in Boston was 1973 ,so post YK most memorable to me was that year, certainly seeing the Ravs reactions and comments on the international situation left an indelible impression on me.His hashkafa about our position in the world and BTW how to deal with those who might disagree with us is different than much of what we see currently. FWIW I read and listen to many RY at RIETS..
Mycroft-we have well documented evidence from family members that RYBS was humming nigunim from Neilah hours after Maariv on Motzaie YK because of his mood of having been Lifnei HaShem on YK. It is great that you listen and read many shiurim but that IMO is not the same as being present in the Beis Medrash for shurim, seeing a fulled night seder after a tough dual curriculum and the interaction with RY all of whom learned in the same Beis Medrash. How RYBS felt about “our position in the world and BTW how to deal with those who might disagree with us is different than much of what we see currently” has no relevance to how RYBS felt after Neilah or Hallel on Leil Seder . Mycroft-you tend to quote Dr T Lichtenstein’s article-RAL ZL in the JU Judaica had a quite different perspective and praised the differences between the 1950s and this century that he saw in the RIETS Beis Medrash. So we’ve veered back onto Topic A, “Who here (or sometimes not here) is Rav Soloveitchik’s truest disciple?” Aside from never ending, this type of discussion frustrates us in the out crowd who can’t identify all the disputants.